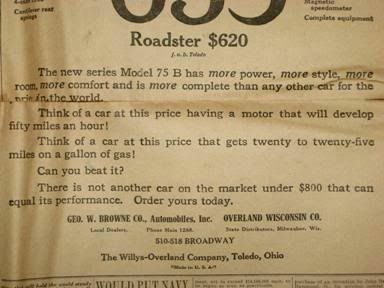 In my last post I looked at an issue of the Milwaukee Journal from July 1916. 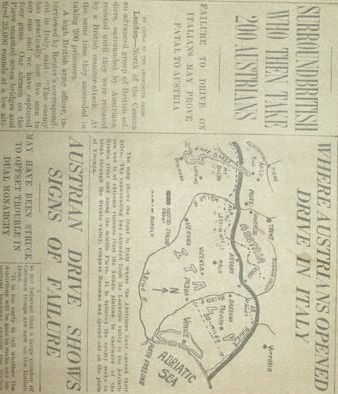 Here we're going to jump ahead to the paper from 17 June, 1918. 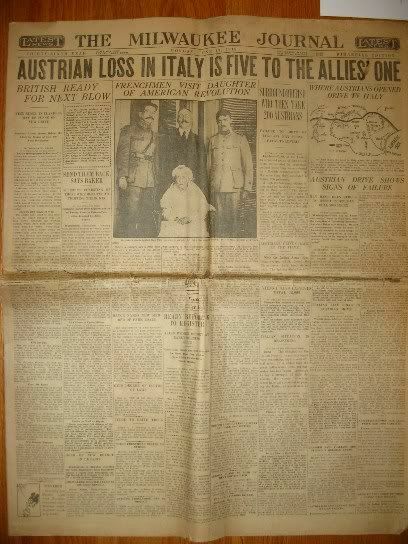 Once again, World War I looms large on the front page. The United States had declared war on Germany in the spring of 1917 although it was only at about this time that large numbers of American troops were being deployed on European soil. 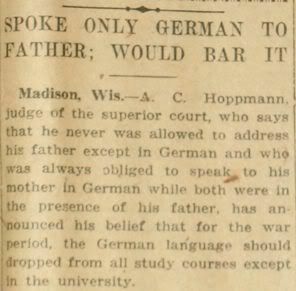 Because of our declaration of war, many German-speaking individuals in Wisconsin started to speak out in favor of English as a primary language so as to distance themselves from their belligerent cousins across the ocean. These articles reminded me of a lecture I attended last fall about the German language in Wisconsin. Professor Joe Salmons noted the move from German to English amongst many Wisconsonians and remarked that World War I was certainly a factor but that the rush to English was already well underway at this time. Firstly, I like how the ships are referred to as "Norse" instead of "Norwegian" as you'd likely read today. Secondly, I had no idea that so much shipping was sunk right off our coast. In the above case, the barks were 90 miles offshore. Was that considered territorial waters back in those days? Even if not, 90 miles is just a hop, skip, and a jump away from the U.S. mainland. Moving away from war we encounter some alcohol-fueled domestic conflict. 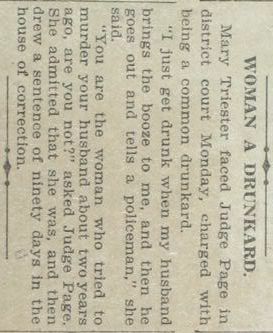 So, she tried to murder her husband back in 1916 yet he stayed with her despite this?! That guy took the whole "for better or for worse" thing quite seriously indeed. 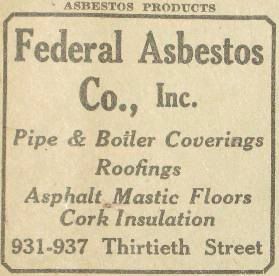 Here's an ad for a company the likes of which you won't find today. I love this one. Imagine not having electricity. And I don't mean that a storm has caused a blackout or that you've missed a couple payments that you have to catch up on before the electric company will restore your service. I mean you don't have the wires attached to your house. 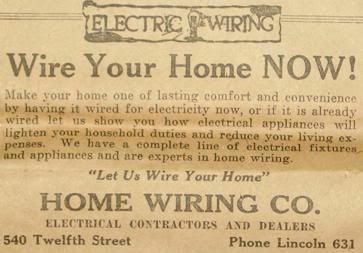 Well, in 1918 there were still homes in Milwaukee that did not have electric service. By this time, you might head over to the rather new Downer Theatre to catch a flick. The Downer is still open today. 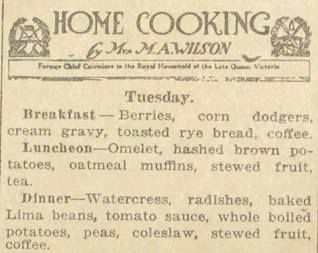 And just like today, the newspaper gave Milwaukeeans culinary ideas. You can't read it in the above photo, but those menu ideas came courtesy of Mrs. M.A. Wilson, "Former Chief Cuisiniere(? – it's difficult to make out) in the Royal Household of the Late Queen Victoria". Wowzers! Interestingly, there is no meat on her menu. Corn dodgers, if you were wondering, are a bit like hush puppies but were often baked instead of fried. When I first read it, I had no idea what skat was but I found a webpage which explains that it is a card game. Skat was taken to America by German immigrants and a series of Skat congresses along similar lines to those of its home country began at Brooklyn in 1887. 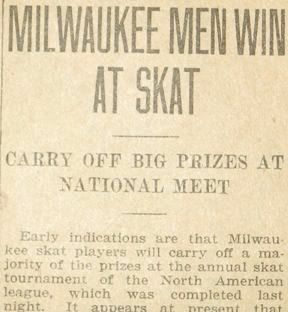 An American Skat League was founded in 1898 at the fourth of the series, which continued in 1926. American Skat could be described as a streamlined version of the German game prior to the substantial revisions it underwent in 1927-8. Skat here refers either to what I know as sheepshead or a close variant of the game with which I am familiar. It might be the only card game to have a statue erected in its honor, as explained at the page referenced above. Lastly, we have an advertisement for a bogus health remedy, a form of BS which plagues newspapers today, unfortunately. 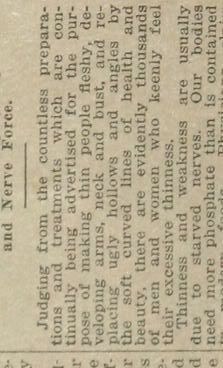 "…thousands of men and women who keenly feel their excessive thinness." Oh, that's rich. Instead of targeting the overweight, the overly thin are encouraged to consume phosphate to replace those "ugly hollows and angles" with "soft curved lines of health and beauty". 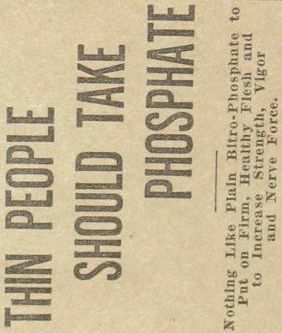 Nothing like plain bitro-phosphate indeed. I recently browsed through a couple old issues of the Milwaukee Journal. (The Journal merged with the Milwaukee Sentinel in 1995 to give us today's Milwaukee Journal-Sentinel.) It's always fun to see how the times have changed and imagine what life was like back in the day. But I'm still amazed at how the old adage "The more things change, the more they stay the same" rings true. You'll see what I mean as I go through some of the highlights. 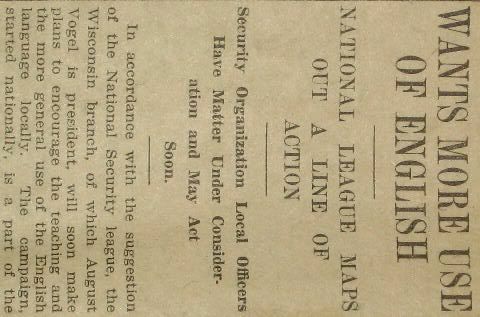 First let us tackle the issue from 1 July, 1916. The photo above doesn't give you an idea of the scale, but the MJ at this time put the broad in broadsheet. It is much wider than newspapers today – probably a good two or three inches. 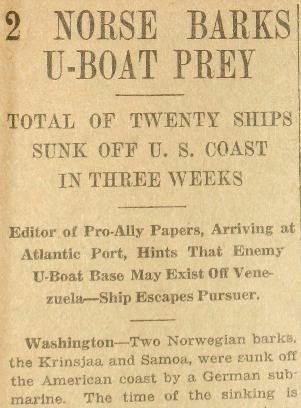 Although the United States would not enter World War I for another ten months, the conflict was headline news and several front page articles are dedicated to it such as this one. 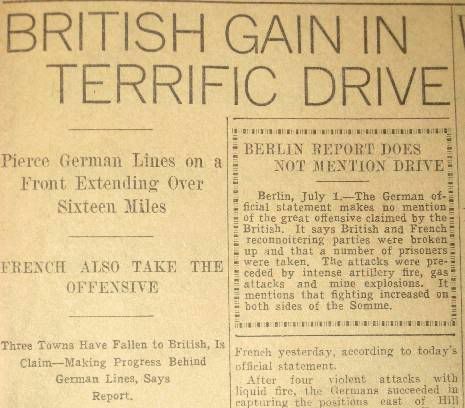 The Journal was Milwaukee's evening paper and here it appears to be reporting on the opening of the legendary Battle of the Somme which began that day at 7:30A.M. local time in France. (Some film footage of a mine going off that marks the start of the battle can be found at this link. It is a .mov file.) I say "assume" because, although the article notes the battle taking place 16 miles north of the Somme river, the English essentially got their asses handed to them on a plate that first day with 58,000 British soldiers dying. Terrific drive it wasn't. However, it is understandable that the officers at the British headquarters in France weren't too keen on letting that bit of information get out to the public. While the countries of Europe were continuing their long tradition of fighting each other, things weren't so rosy here in North America. The Mexican Revolution was ongoing and President Woodrow Wilson was highly unamused at having to deal with Europe on the one hand and instability to the south on the other. Just a few months earlier Pancho Villa and his band of men had run roughshod through New Mexico and now found themselves with Brigadier General John Pershing in pursuit. 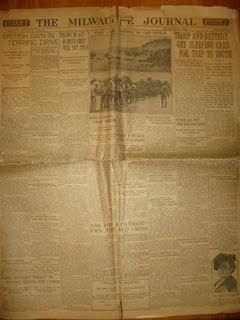 A mere ten days before this paper was published was the Battle of Carrizal in which Pershing and his troops confronted the Mexican army instead of their intended target, Villa. One thing that immediately struck me upon looking at the paper was just how many stories or, perhaps a better description would be blurbs, there were. The front page is just full of them. Some are almost tweets. This is in stark contrast to the newspapers of today which have much fewer articles but the ones they do print are quite a bit lengthier. Here are a couple examples of the concise accounts that litter the front page. There must be a couple dozen of them. 1) I used to live up by Altoona and my stepsister lives there today. 2) It illustrates Wisconsin's "culture of alcohol" which many 21st century Cheeseheads seek to undo. 3) People getting pissed at local government for disallowing a tavern is funny. 4) I guess I'll add a fourth – I had to wonder why this made news in Milwaukee. 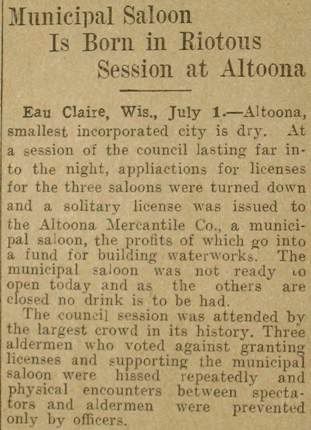 Altoona is a small town about 250 miles from Milwaukee so why was this considered to be of interest? Madisonian David Blaska blogs incessantly about how kids these days aren't well-behaved – unlike when he was a child, of course. Things are always better "back in day", aren't they? Using this logic, 1916 should have featured some of the nicest, most obedient children in history. 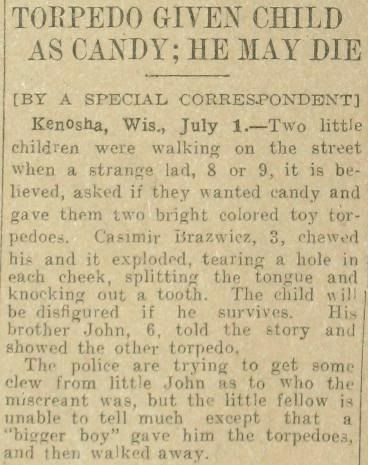 Well, check out what some miscreant in Kenosha did to a 3-year old. Also notice how the paper uses "clew" instead of "clue". 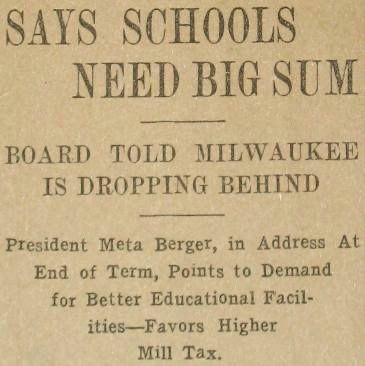 Even 93 years ago there were cries to raise taxes to fund the Milwaukee public schools. The puffery here is certainly on par with that of today's advertising. 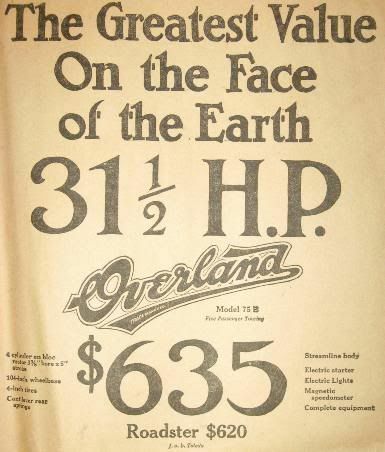 And 31.5 horsepower!! So what did your $635 get you? A bit further in are the entertainment listings. 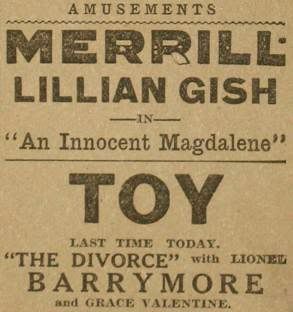 Check out the movies playing at the cinemas in 1916. You've got your superstars (Gish & Barrymore) as well as your blockbuster (Birth of a Nation) just as we do today. A page or two later and we're at the sports section. 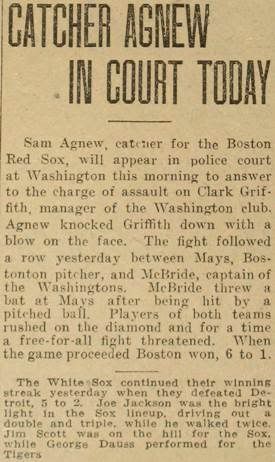 Some athletes were belligerent assholes back then not unlike some are now. And there's "Shoeless" Joe Jackson before the White Sox became the Black Sox. One small paragraph summarizing a baseball game. When did sports become its own separate section in the paper wherein every game was an epic battle and deemed worthy of 1000 words describing almost every play as if it the world depended on it? Lastly, we come to the back of the paper which was devoted to classified ads. These are familiar to us although some of the types of ads may not be. A long way from the feminist movement of the 1960s & 70s. Heck, women's right to vote was still a few years away. 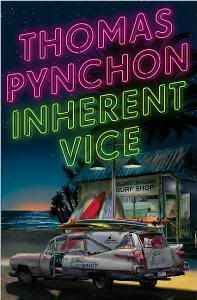 Thomas Pynchon has a new book out next month - Inherent Vice. Here's the review from The New Yorker. 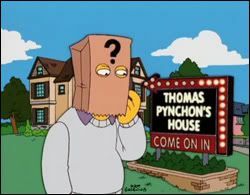 Much to my shame, I have to admit that I've never read any Pynchon. I have read about Gravity's Rainbow and remember well when Mason & Dixon came out but just haven't cracked one of his tomes open. The Coen Brothers latest film, A Serious Man, now has a trailer. 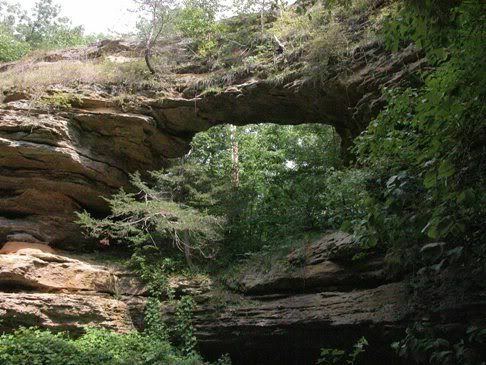 After hitting Pewits Nest, Dogger, Miss Regan, The Dulcinea, and I heeded the words of Horace Greeley and went west to Natural Bridge State Park. 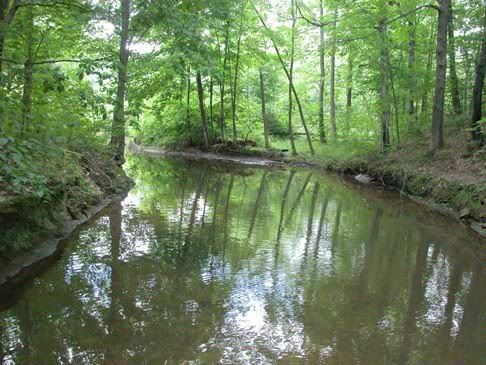 The park is out in a driftless area, i.e. - beyond where the last glacier was able to infiltrate and deposit its detritus or drift. 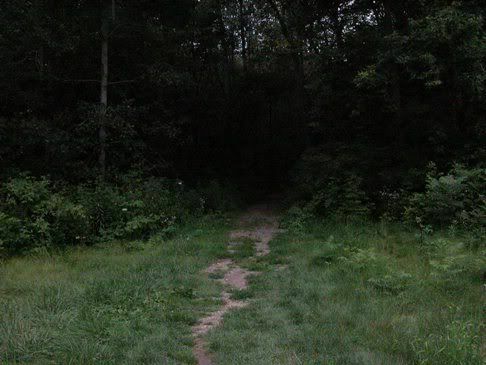 Since I didn't adjust my camera's aperture correctly, the park looks like some Dantean dark woods here. As Count Floyd used to say, "Oooh, that's scary!" 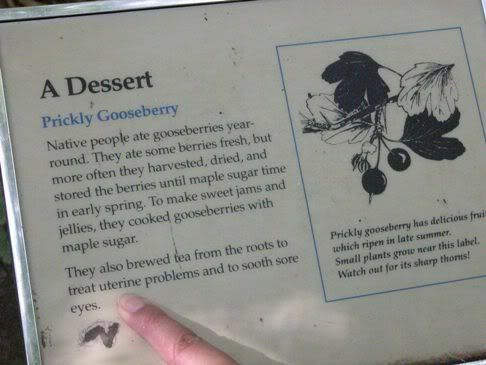 Shortly after entering, I discovered the trails to be littered with signs laden with information on the flora. 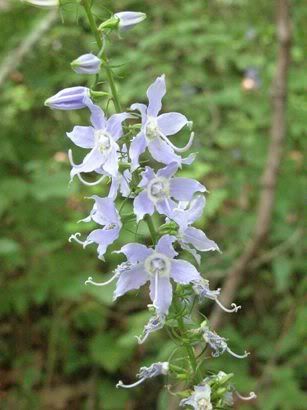 Hikers will learn how the natives used a particular plant as a medicine or ate it as food. 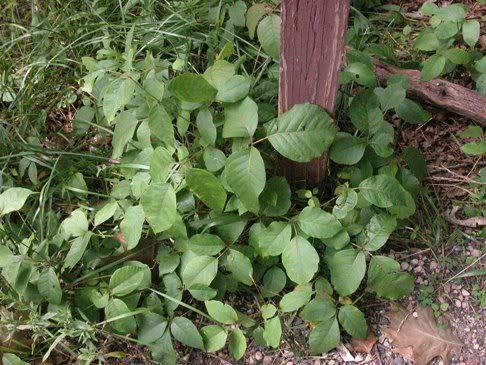 However, the first marker we encountered was rather ominous in that it described poison ivy and admonished readers, "Leaves of three? Let it be!" Not content with a mere placard, park rangers made sure that there were some of the infernal plants growing at the base of it. 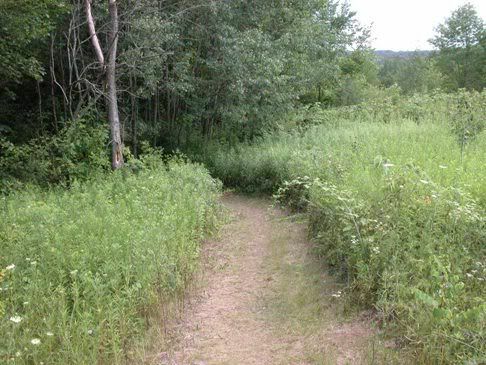 Part of our path took us out of the woods and along the perimeter of a large overgrown field. It was the kind of place where you'd expect to see two lovers running at one another in slow motion in a BBC drama. 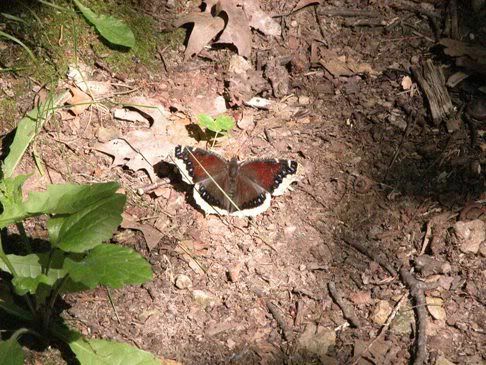 Once back into the realm of the trees, we saw some pretty flowers and a butterfly. Miss Regan availed herself of the opportunity to dig in the dirt as well. Does any reader know what kind of flower that is? 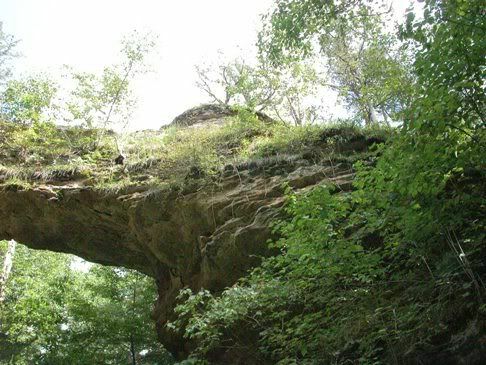 Anyway, it wasn't look before we beheld the Natural Bridge before our very eyes. The opening is about 25' high and 35' across. Dogger told us, just as he had at Pewits Nest, that the psammolithic feature before us dated to the Cambrian era which was a long time ago indeed. 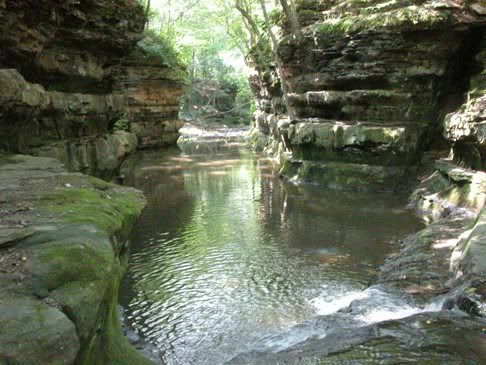 ("That's Cambrian sandstone," he stated authoritatively.) Not quite a Sagan unit (billions and billions) but still 1+ billion years. (I think that I am going to start using the phrase "Cambrian sandstone" as often as possible as it makes one appear erudite. E.g. – "The Capitol was built from Cambrian sandstone. If you look close enough, you can see worm burrows.") Kidding aside, it was quite awe-inspiring to be standing next to something more than a billion years old. It has no doubt seen things I couldn't even begin to imagine. By the way, walking on the bridge itself is verboten. 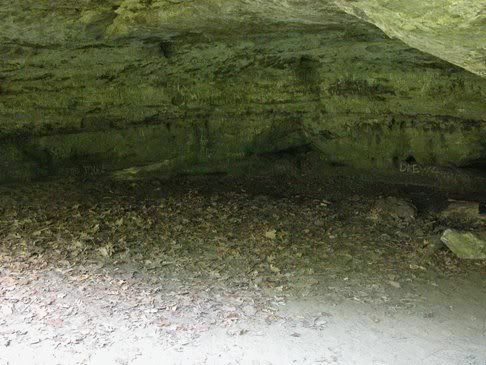 Beneath lies a shelter which was home to a group of natives some 11,000 years ago when the glaciers were in retreat. It was strange to think that we were in what was essentially, at some point in the dim and distant past, someone's front yard. Today it is mostly used by teenagers who want to carve things into the walls when intoxicated. It is also forbidden to walk into the shelter but, for you, dear readers, I shirked the rules and grabbed some snaps. Dogger related a tale of a teenage girl who was once in the park at night with friends drinking and carousing. They had scaled heights they shouldn't have and, when confronted with the arrival of the police, the poor lass ran the wrong way and off part of the sandstone formation to her early demise. Regan apparently inherited the morbid curiosity of her father and was keen to check out the bones. When informed that the body had been removed, she was clearly displeased. 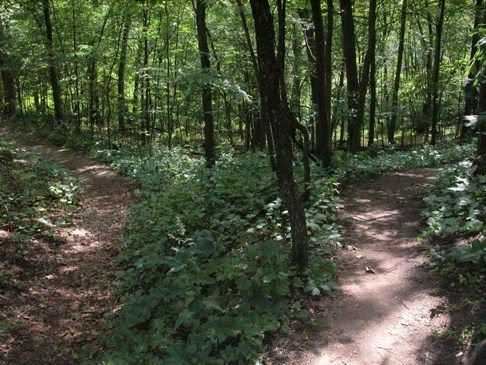 Continuing our trek, we found that the road diverged in the woods. Sorry we could not travel both, our party followed to the right and eventually found a mushroom and one of those placards describing how tasty gooseberries are. 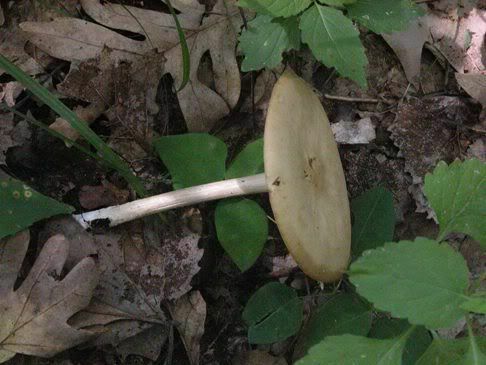 Now, I'm not the most mycophagous guy around but I'll bet that mushroom wasn't edible. At the top of the hill, we were afforded a wonderful view. 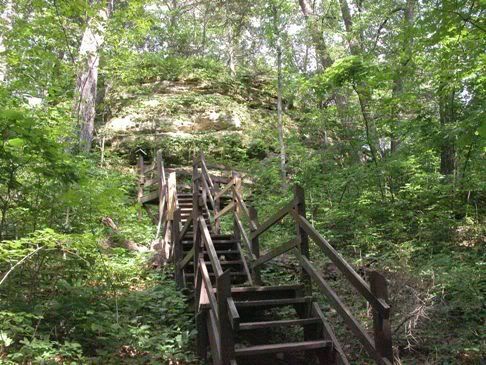 On our way down, we descended some stairs which would have looked at home in Lothlórien. 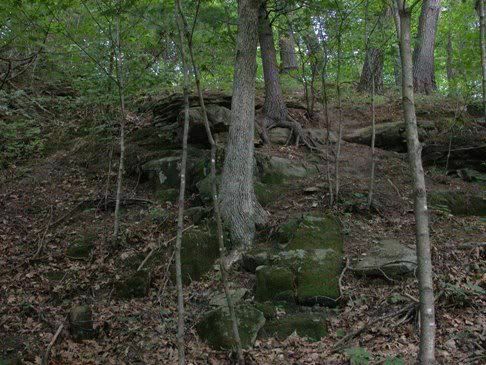 Although there were some deer tracks, the hike was notable for the near absence of animals. Perhaps I'll see more when Dogger and I do a longer hike there along the ridge in the photo above from the top of the hill. Between now and then, however, I'll have to be content with coulees and granite on my vacation next week. Sunday afternoon provided the perfect opportunity to do a bit of hiking. 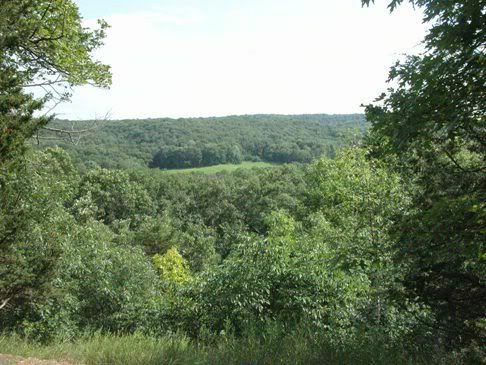 My friend Dogger, Miss Regan, The Dulcinea, and I began things by heading to the Baraboo Hills. 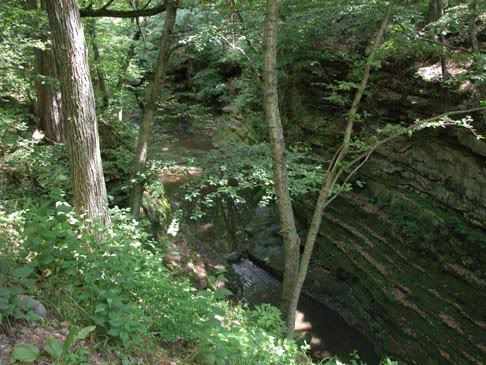 Our destination was Pewits Nest, a state natural area just southwest of Baraboo. 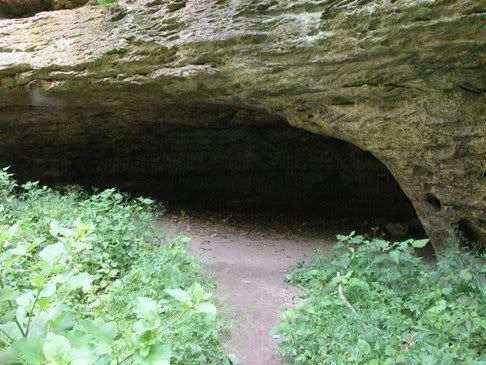 It was so named because "an individual lived in the solid sandstone, like a gnome in a cavern. 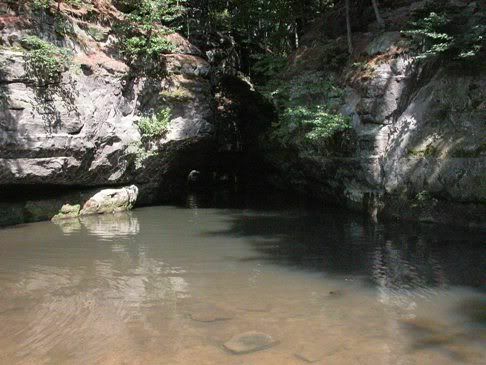 His abode was some ten feet above a deep pool of water. This dwelling resembled the nest of a phoebe (or peewit, an earlier name for this bird), hence dubbed by early settlers the 'Peewit's Nest.'" 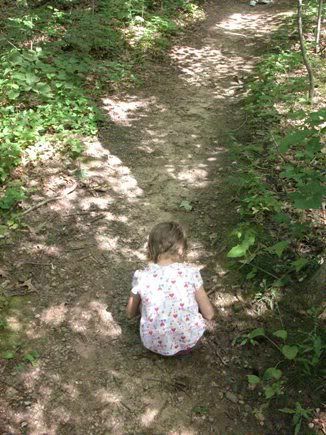 We began by hitting the trail which began at the parking lot. It got pretty steep at times but was leisurely for the most part and we eventually surmounted the hill. 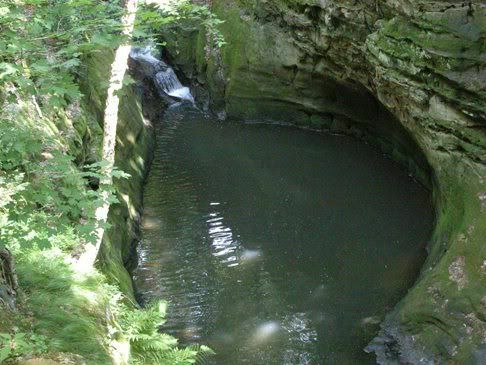 Once at the top, we were afforded some wonderful views of the gorge with Skillet Creek at the bottom. 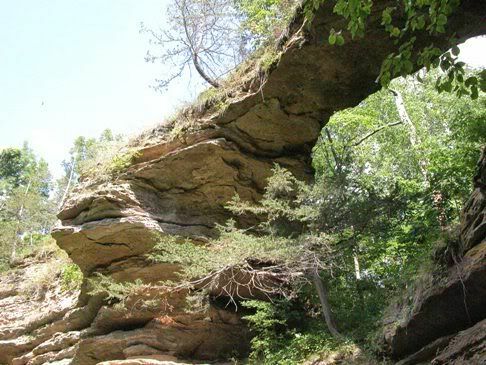 The creek cut its path through the sandstone 10,000+ years ago as the Laurentide ice sheet retreated. 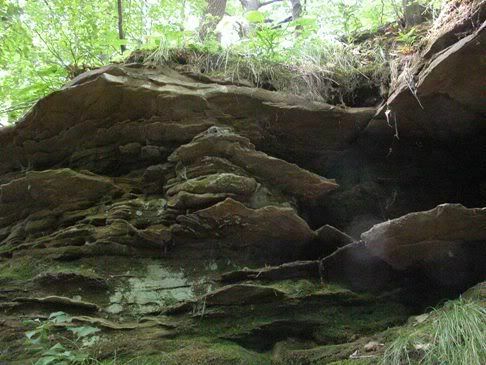 Dogger has been reading Roadside Geology of Wisconsin and was quick to point out that the sandstone in question is, in fact, Cambrian sandstone. 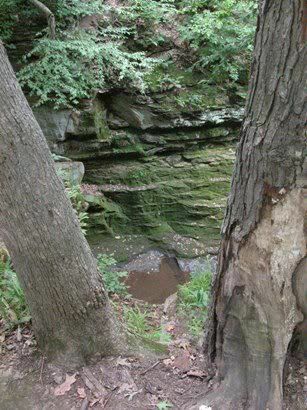 We continued and were soon down walking along a narrow stone outcrop along the creek. 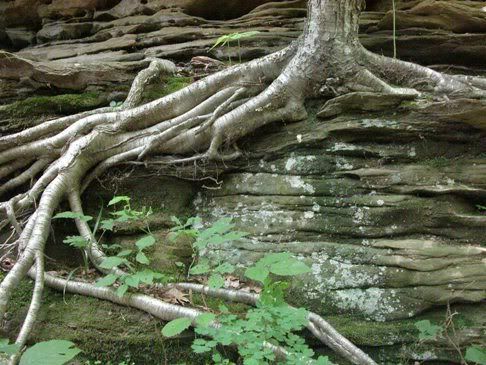 The layers of rock were really neat and several trees had grown into the walls of the gorge whose root system was exposed. 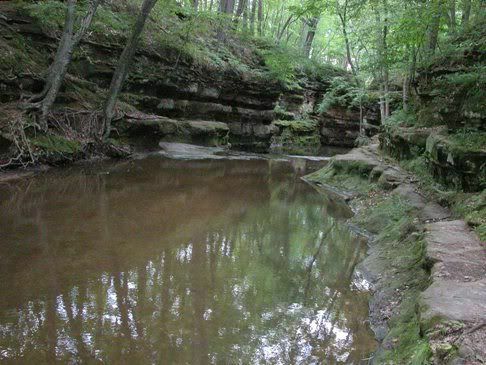 The creek was very shallow at a small falls so it wasn't difficult to get across. From there it was back up the hill and over to the opposite end of the gorge. 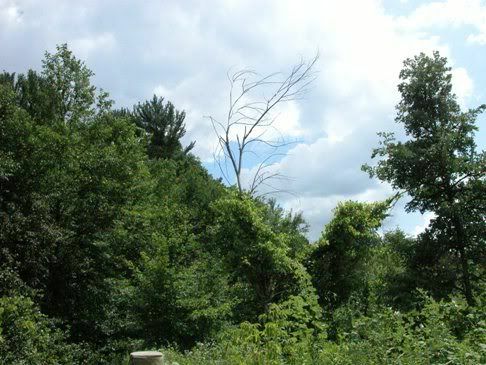 Along the way, we caught of glimpse of the structure which gives the park its name.